As is the case with most vegetables and fruits, pumpkins are a seasonal vegetable. If you grow pumpkins in your backyard or at a farm, you might want to store pumpkin seeds for planting the next year and thus ensure an abundance of pumpkins each year. Fortunately, you will not have to spend too much time nor do you need any special equipment for storing pumpkin seeds. Cut open a large, mature pumpkin with a sharp knife and carefully remove all of the pumpkin seeds inside. Since it is mostly children who love to see pumpkins carved into jack-o-lanterns, you might want to hand a bowl full of pumpkin pulp to each of your children and ask them to separate the seeds from the pulp. Just make sure that the children doing this task do not make too much of a mess in the process. Gather all the seeds in a large bowl and wash them properly. This will get rid of most of the pumpkin pulp remaining on the seeds. To make the seeds cleaner, gently scrub them with a soft brush and wash them for a final time. 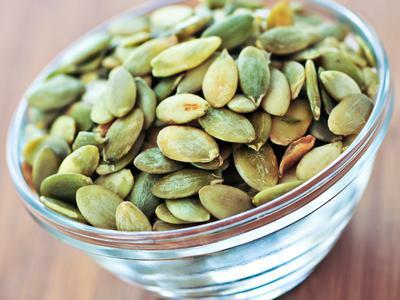 Lay a large newspaper on a flat surface and spread the pumpkin seeds on it. This will not only soak out all of excess water but will also speed up the drying process so that you can store the seeds properly. You may have to wait for several days or even a whole week until the seeds dry. Be sure to check the seeds for mould formations and to turn the seeds over every day. Temperature, humidity level and the size of the seeds you are drying are some of the factors that will affect the time required for the seeds to dry. Transfer the dried seeds to a clean, airtight jar. Store the container in a cool, dry place after marking it with the words ‘Pumpkin Seeds’. This will avoid possible confusion between pumpkin and melon or squash seeds as all of them look pretty similar. The ideal time for planting pumpkins is spring, when the danger of frost does not prevail anymore. This is because there is absolutely no way pumpkin seeds will grow in harsh winters.